Greek Debt: Light at the End of the Tunnel? Oxi! No! After being asked whether or not to accept the austerity proposal submitted by the European Union (EU), the European Central Bank (ECB) and the International Monetary Fund (IMF), Greece defiantly decided to reject them with an overwhelming 61.31% vote during the previous weekend’s referendum. What happened since then and how did it affect the euro’s forex movement? I came up with a quick rundown of the latest developments to help you stay in the loop! Varoufakis – Minister No More! Consequently, Greek Prime Minister Alexis Tsipras believed that pandering to this “preference” would be potentially helpful in reaching a deal with the creditors. It’s really quite understandable since Varoufakis has been rather combative, to put it nicely, and many Eurogroup participants have openly expressed just how much they dislike him. Romania, Croatia, and Bulgaria are some of the most vulnerable countries to a potential contagion effect. Bulgaria, in particular, is under severe pressure since more than 20% of its banking assets are Greek-owned. Moreover, only 13 of the 28 EU members have implemented the Bank Recovery and Resolution Directive (BRRD), a sort of firewall meant to limit the cross-border effects of failing banks (i.e. contagion). Based on currently available data and Open Europe Today’s calculations, Germany has the largest exposure to Greece, followed by France, Italy, and Spain. Slovenia is also worth noticing since it has the largest exposure to Greece in proportion to its GDP, which means it would get slammed the hardest if something bad happens to Greece. 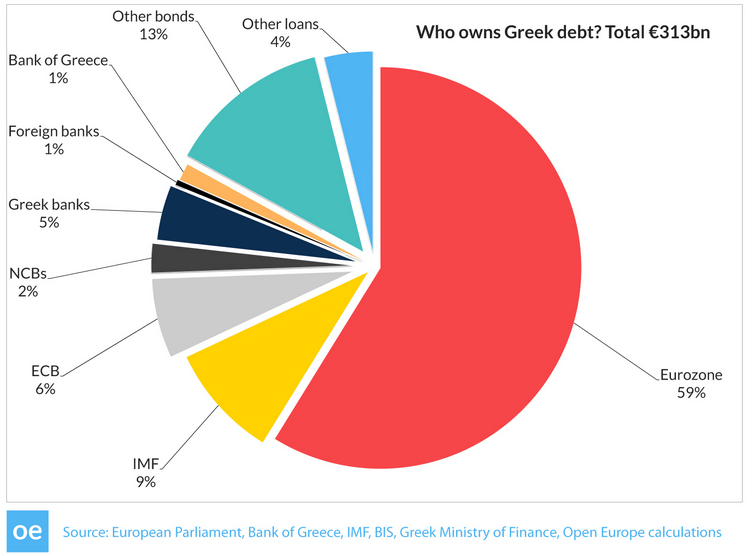 Open Europe Today also came up with this nifty chart illustrating who’s gonna be left holding the stinky bag should a deal with Greece collapse. Check it out! Greece submitted a new economic reform proposal to its creditors later on in the week, giving forex traders reason to feel hopeful about the country’s fate again. This proposal was meant to secure a new international bailout loan to keep the collapsing Greek financial system afloat. And this ain’t a rumor since Eurogroup Chairman Jeroen Dijsselbloem’s spokesman has confirmed this, although he refused to comment on the content of the proposal. It doesn’t really matter because a copy of the proposal was leaked a little while later. In the proposal, various reforms were promised such as strong disincentives to early retirement and phasing out solidarity grants for pensioners. VAT would also be raised to a unified rate of 23%, while tax discounts on islands, especially the high-income tourist destinations, would be eliminated. The special tax treatments of the shipping industry would also be eliminated and the tonnage tax will be increased. Needless to say, some of these reforms are strikingly similar to the ones contained in the creditors’ original proposal – the very same proposal that Greece voted against. Of course, this is not total capitulation since Greece is now asking for a €53.5B bailout deal, which should be enough to cover its obligations until 2018 or so. Gaps that were caused by the “no” vote during the referendum were promptly filled and then some. But the bullish momentum really kicked it up a notch when Greece announced that it had a new proposal (which was then mysteriously leaked). Heck, most euro pairs ended the week on a higher note. It almost seems like there’s no debt crisis weighing on the currency’s price action! Depending on the outcome of EU meetings over the weekend (again!) and whether or not Tsipras and his boys finally shake hands with their creditors at the end of Greece’s five-day ultimatum on Sunday, another set of weekend gaps might be seen among euro forex pairs. And if these latest set of plot twists are able to magically give the Greek debt drama a happy ending, the euro might be in for sustained rallies.